It is hard to believe that Ivey has been with us for a year now. What a fun and wonderfully spunky addition she is to our family. 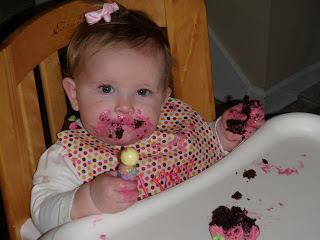 She laughs more than any baby I've ever known and loves to dance but her greatest love is eating-especially cupcakes! Isatu wearing "uncle" Andrew's glasses.